Kroger will up the ante in 2015 and beyond, increasing its sponsorship of JTG Daugherty Racing, the No. 47 Chevrolet and driver AJ Allmendinger to at least 24 races in a new, multi-year pact. After six years of sponsoring the No. 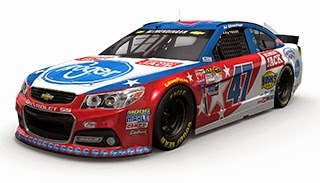 47 Chevrolet in the Daytona 500, Kroger will have primary real estate in two-thirds of all events in coming seasons. Allmendinger, who has one win, seven Top-5 and 37 Top-10 finishes as well as earning a spot in the 2014 Chase, said he welcomes the new relationship. “The folks at Kroger are so pumped up about being a part of this race team,” he said. “They are just as excited as I am. “Tad and Jodi (Geschickter) and Brad (Daugherty) have a longstanding relationship with Kroger through their Daytona 500 partnership and it is cool to see it grow into something so big. One of the world's largest retailers, Kroger employs nearly 400,000 associates in 2,625 supermarkets and multi-department stores in 34 states and the District of Columbia. The company operates under two dozen local banner names, including Kroger, City Market, Dillons, Food 4 Less, Fred Meyer, Fry's, Harris Teeter, Jay C, King Soopers, QFC, Ralphs and Smith's. The company also operates 782 convenience stores, 326 fine jewelry stores, 1,330 supermarket fuel centers and 37 food processing plants in the United States. Recognized by Forbes as the most generous company in America, Kroger supports hunger relief, breast cancer awareness, the military and their families, and more than 30,000 schools and community organizations. Kroger contributes food and funds equal to 200 million meals a year through more than 80 Feeding America food bank partners. A leader in supplier diversity, Kroger is a proud member of the Billion Dollar Roundtable and the U.S. Hispanic Chamber's Million Dollar Club. Allmendinger currently ranks 22nd in the Sprint Cup championship standings, after a 13th-place finish at Richmond International Raceway last weekend. 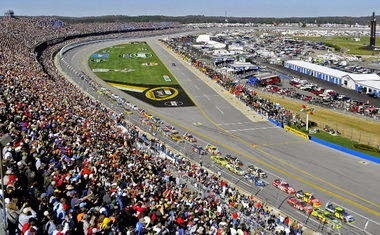 Talladega Superspeedway announced today that the crowd for this weekend’s GEICO 500 NASCAR Sprint Cup Series race will be comprised of fans from 24 countries across five continents -- North America, South America, Europe, Asia, and Australia -- including each of the 50 United States and the District of Columbia. The longest haul to attend the event will be by a group of fans from Australia, who will travel more than 9,300 miles to attend. More than 70 percent of the track’s fan base comes from outside of the state of Alabama, generating more than $380 million annually for Alabama tourism. The weekend kicks off Friday with practice sessions for the GEICO 500 NASCAR Sprint Cup Series race and NASCAR XFINITY Series Winn-Dixie 300, along with as practice, qualifying and a 5 pm green flag for the International Motorsports Hall of Fame 200 ARCA Racing Series Presented by Menards event. The evening concludes with the “Big One on the Blvd” Mardi Gras-style parade, which will feature NASCAR drivers and fan competitions on the track’s infield Talladega Blvd. Saturday’s slate includes qualifying for the GEICO 500 and Winn-Dixie 300, followed by the start of the Winn-Dixie 300 at 2 p.m. The day concludes in the evening with the track’s traditional infield concert featuring country music maverick Chase Rice, along with Buddy Brown and Dee Jay Silver. The concert is free with the purchase of a Sunday GEICO 500 admission ticket. 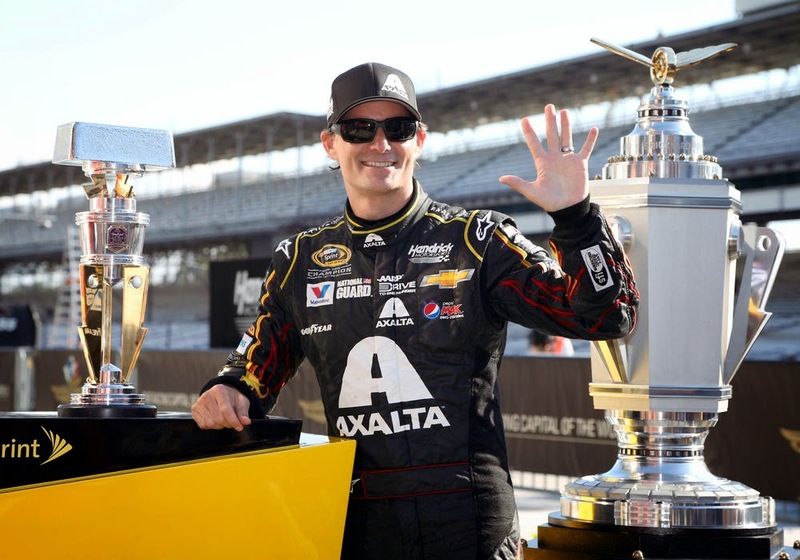 Five-time Brickyard 400 winner and four-time NASCAR Sprint Cup champion Jeff Gordon will drive a Corvette Z06 pace car for the 99th running of the Indianapolis 500 mile race, May 24 at the Indianapolis Motor Speedway. David Ragan will drive Michael Waltrip Racing’s No. 55 Aaron’s Dream Machine for the remainder of the 2015 NASCAR Sprint Cup season, beginning next weekend at Kansas Speedway. Brian Vickers had planned to race the Toyota fulltime in 2015, but heart surgery in December forced the Thomasville, N.C., native to miss the first two races of the season. Vickers returned at Las Vegas on March 7, but was sidelined two weeks later by recurring blood clots in his lungs. No timetable has been set for his return. Michael Waltrip, who drove the No. 55 Aaron’s Toyota in the Daytona 500, will compete this week at Talladega Superspeedway. Brett Moffitt owns six starts in the No. 55 this year, with a career-best eighth-place finish at Atlanta Motor Speedway in March. Ragan is 19th in NASCAR Sprint Cup driver points earned largely by racing the No. 18 Toyota for Joe Gibbs Racing as the substitute for the injured Kyle Busch. “Life has thrown a lot at MWR the first part of this racing season, but our team has stood tall and worked through it,” said Waltrip. “Our original plans for the No. 55 team have been challenged since December and we felt it was important for our employees and our sponsors to solidify the remainder of the 2015 season. The opportunity to bring David Ragan into the team is incredible for a number of reasons. He will bring experience, consistency and a lot of confidence based on how he has been running with our Toyota teammates at Joe Gibbs Racing. He also puts the No. 55 team and Aaron’s right back into the Chase for the Sprint Cup contention, which is a very positive turn of events for that team. “There is absolutely no question about Brian Vickers’ ability, but there remains a question of his availability. We are going to remain very close with Brian while he works on his plan to return. We have told him that MWR is here when he has a clear picture about what the future holds, but we don’t need to add any timeline pressures. He is working with a lot of medical advisors and once he has established his plan, we will sit down and discuss next steps. The 29-year-old Ragan, who celebrates his 300th Sprint Cup start at Talladega this weekend, said he eagerly awaits driving for his new team. Front Row Motorsports owner Bob Jenkins, for whom Ragan drove at the start of the 2015 campaign, said. "We are grateful to David Ragan for his contributions to the growth of Front Row Motorsports and his commitment to our partners over the past three years. He led us on our first trip to Victory Lane, and that's a moment we'll never forget. We wish him the best with his new team. Roush Fenway Racing driver Chris Buescher will drive FRM’s No. 34 Ford at Talladega this weekend. The team is working on finalizing its driver line-up for the remainder of the season. Danica Patrick will be looking for a new daddy next season. USA TODAY Sports reported today that GoDaddy will not return as sponsor of Patrick’s Stewart Haas Racing No. 10 Chevrolet in 2016, choosing to focus its marketing efforts on small business and international markets outside of NASCAR. The online domain registry will attempt to sign Patrick to a new personal services contract. Patrick is currently in the final year of her Stewart-Haas contract, and enjoying the most competitive season of her NASCAR career. She is currently 16th in the championship standings with a pair of Top-10 finishes and a best finish of seventh in nine starts. "We love Danica and all she does to empower and inspire people, especially women, which is why we are working to keep her in the GoDaddy family," said GoDaddy chief marketing officer Phil Bienert to USA TODAY. "We have the utmost respect for Stewart-Haas Racing, and they've been phenomenal partners. But at this stage, we need a range of marketing assets that reach a more globally-diverse set of customers." GoDaddy’s decision marks the end of an on-track relationship that dates back to 2007, when Patrick drove for Andretti Autosport in the IndyCar Series. They have served as her primary sponsor since 2010. SHR executive vice president Brett Frood said the team is actively seeking new backers for Patrick and the No. 10 team. After three consecutive weeks of troublesome weather at Texas, Bristol and Richmond, Talladega Superspeedway is trumpeting a “Chamber of Commerce” forecast for this weekend’s (May 1-3) GEICO 500 weekend. In addition to the NASCAR Sprint Cup Series GEICO 500, the NASCAR XFINITY Series Winn-Dixie 300 and ARCA Racing Series International Motorsports Hall of Fame 200 are all on tap. Friday’s schedule includes practice for both NASCAR series, as well as practice, qualifying and the ARCA International Motorsports Hall of Fame 200. Saturday features Coors Light Pole Award Qualifying for the GEICO 500, as well as XFINITY Series qualifying and the Winn-Dixie 300. 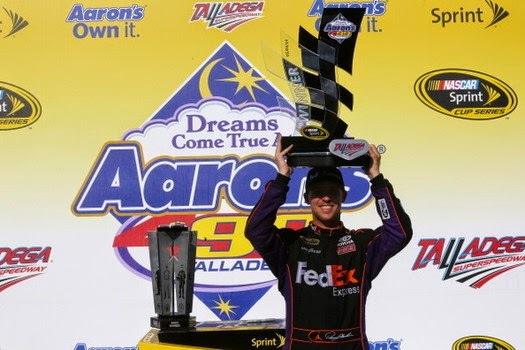 Don't miss "The Big One on the Blvd"
Sunday’s GEICO 500 gets the green flag at noon (CST) on Sunday, with Denny Hamlin looking to become the first repeat winner of the spring classic since Jeff Gordon pulled off the feat in 2004-05. Gordon, meanwhile, will make his final GEICO 500 start as the circuit’s winningest active driver with six Talladega victories. Talladega recently announced a list of fan upgrades, including larger Sprint Vision digital high-definition video screens on the frontstretch. Two of the video boards now measure a mammoth 40’ x 80’ in size and will have permanent homes behind pit road in the tri-oval area. One will be located atop Gatorade Victory Lane, with the other in front of the Media Center. Another permanent 26’ x 52’ video board will be located at the exit of Turn Four near the Infield Care Center. Other screen locations include the Start/Finish Line (26’x ’52), Turn One (18’ x 33’), along with the Alabama Gang Superstretch (20’ x 27’). Talladega’s infamous Saturday Night Concert, near Talladega Blvd, will be headlined by country music maverick and Columbia Nashville recording artist Chase Rice, with special guests Buddy Brown & Dee Jay Silver. Brown opens at 7:30 pm followed by Dee Jay Silver at 8:30 pm. Rice takes the stage at 9:00 pm. The concert has become a popular event at Talladega Superspeedway, and is free with the purchase of a Sunday GEICO 500 ticket. The track will also present its annual “Big One on the Boulevard” Friday, with a Mardi Gras-style parade on Talladega Blvd., kicking off at 7:30 pm and featuring top drivers Clint Bowyer, Ricky Stenhouse, Jr., Austin Dillon, Ty Dillon, Brad Keselowski, Brendon Gaughan, Ryan Blaney, Michael Waltrip, Kyle Larson and Greg Biffle. They will oversee countless activities such as the “Angry Wieners” competitive eating contest; “Body Pong,” an individual game of skill and luck featuring liquid filled balloons; and the infamous BBQ Sauce Wrestling matches. 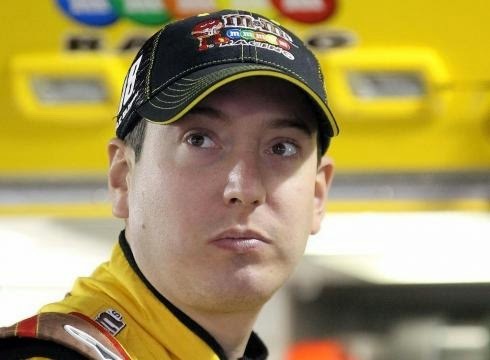 The clock is ticking on Kyle Busch’s hopes to salvage something from the 2015 NASCAR Sprint Cup Series season. NASCAR chairman and CEO Brian France said this week that he would like to “figure out how to accommodate” Busch’s desire to race in the 2015 Chase when he returns from injuries suffered at Daytona International Speedway on February 21. And while the sanctioning body has the leeway to overlook Busch’s absence from the 2015 starting lineup so far, there are other requirements the Joe Gibbs Racing driver will be hard-pressed to meet. 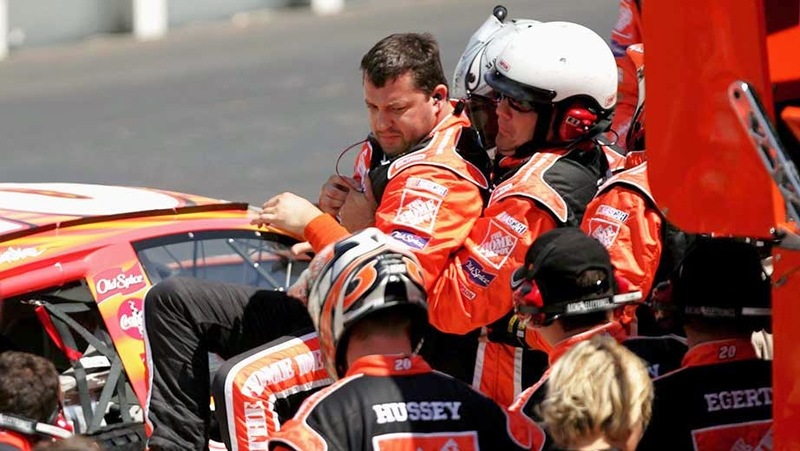 Busch suffered a compound fracture of his right tibia and fibula – along with a broken left foot – in the NASCAR XFINITY Series season-opener at Daytona, and will miss his ninth consecutive race this weekend at Richmond International Raceway. He is still weeks away from a competitive return, and when he does come back, he will need a NASCAR waiver to exempt him from the rule requiring Chase contenders to take part in every race. In addition, he will need to fight his way into the Top-30 in championship points and win at least one of the season’s first 26 races. No matter how NASCAR rules, Busch will have his work cut out for him. Just 17 races remain in the 2015 regular season, and Busch is still weeks away from a return to the cockpit. He admitted recently that there is no timeline for his damaged leg to fully heal, and said he will not press for an early return. "I have to please my doctors," he said Busch, who still carries a rod and steel plates in his right leg, along with several screws in his left foot. "I have to go step by step and do everything they ask. They say my recovery is going faster than expected but… they won't release me a timetable." France made it clear this week that he feels some degree of responsibility for Busch’s injuries. Even if NASCAR awards Busch a waiver, however, the numbers are stacked steeply against him making the Chase. If the M&Ms Toyota driver is unable to return until July – and sources say that is likely the best-case scenario – he will have only 10 races left to fight his way into both the Top-30 and Victory Lane. Even for a driver of Busch’s ability, that’s a tough row to hoe. Busch will be none of those things. ing a possible return in time for the 57th annual Coke Zero 400 at Daytona on July 5. 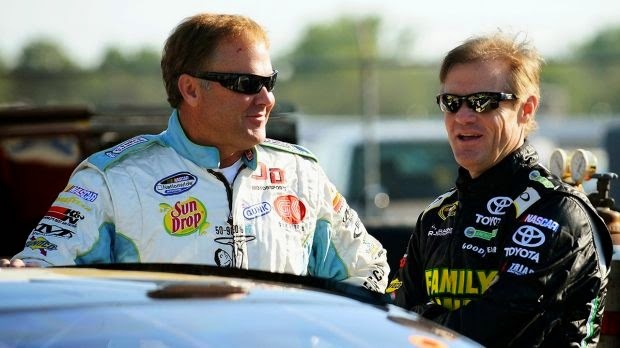 Veteran NASCAR driver and television personality Kenny Wallace will pilot JGL Racing’s No. 26 NASCAR XFINITY Series Toyota next weekend at Talladega Superspeedway, joining teammates JJ Yeley (No. 28 Toyota) and Eric McClure (No. 24 Toyota) for the running of the Winn Dixie 300. The JGL Racing team planned on having Kenny’s brother, Mike Wallace at the wheel of the No. 26 Toyota at Talladega, as he was in the season opener at Daytona International Speedway. However, the elder Wallace underwent triple bypass heart surgery in the Charlotte area last week, and will be unable to compete at Talladega. Kenny Wallace said he is looking forward to returning to the XFINITY Series at one of his favorite tracks. "Talladega is where I have some of my best finishes in my NASCAR career," he said. "I think to have success at Talladega you have to enjoy racing there and that style of racing - and I like it. I look forward to teaming up with JGL Racing and especially my longtime friend Gregg Mixon." Wallace has over 900 career starts in NASCAR's top three series, and will be making his 545th career start in the NASCAR XFINITY Series. His best Sprint Cup Series finish at Talladega came in 2000, when he finished second while pushing the late Dale Earnhardt to his final NASCAR win. Mike Wallace said he hopes to be in attendance to watch his younger brother work, adding, “I am focused on getting back to full strength and returning to the driver's seat in the near future." Since 1970, Motor Racing Network – “The Voice of NASCAR” – has delivered award-winning race coverage to listeners throughout the United States. With today’s introduction of the “Fan Forum Hotline,” MRN will listen to the collective voice of the fans – who can now call toll-free at 1-844-4ASKMRN during live race broadcasts to comment on events taking place on the track or offer an opinion on other pertinent issues. Fans’ comments will air during Motor Racing Network broadcasts across all three of NASCAR’s top national series – Sprint Cup, XFINITY and Camping World Trucks. The Fan Forum Hotline … at 1-844-4ASKMRN … 844-427-5676 … will also be available during the network’s weekly programming. The announcement was made today during MRN’s exclusive radio coverage of the NASCAR weekend at Richmond International Raceway, which will feature the ToyotaCare 250 XFINITY Series race on Friday and Saturday’s Toyota Owners 400 in the Sprint Cup Series. The Fan Forum Hotline will complement the new MRN App that was introduced earlier this year – giving fans unprecedented access to Motor Racing Network content and now, the means to voice their opinion. In February, Motor Racing Network kicked off its 46th year by introducing the MRN App, available for free on Apple and Android devices. Motor sports fans on the go stay in the know with comprehensive coverage of NASCAR, drag racing and dirt-track action from multiple series. They can locate and listen to their local Motor Racing Network affiliate, or the one nearest their location, with the push of a button in the palm of their hand. News and other online content are available, too, from MRN.com. In addition to the Fan Forum Hotline, NASCAR fans have the opportunity to interact with the MRN broadcast crew through Facebook, Twitter and Instagram as part of the MRN App. There is a calendar reminder and NASCAR Series push notices, in addition to MRN archive audio and video. Connectivity to track apps from International Speedway Corporation-owned facilities is also available, featuring quick access for ticket purchases. In addition to exclusive radio coverage of 25 Sprint Cup Series race weekends this year, MRN will broadcast 21 XFINITY Series events and all 23 races in the Camping World Truck Series. The network’s 2015 slate will once again conclude in December with live coverage of the Sprint Cup Series Awards in Las Vegas. Two-time Daytona 500 champion Michael Waltrip will drive the No. 55 Aaron’s Dream Machine Toyota when the NASCAR Sprint Cup Series races at Talladega Superspeedway on May 3. 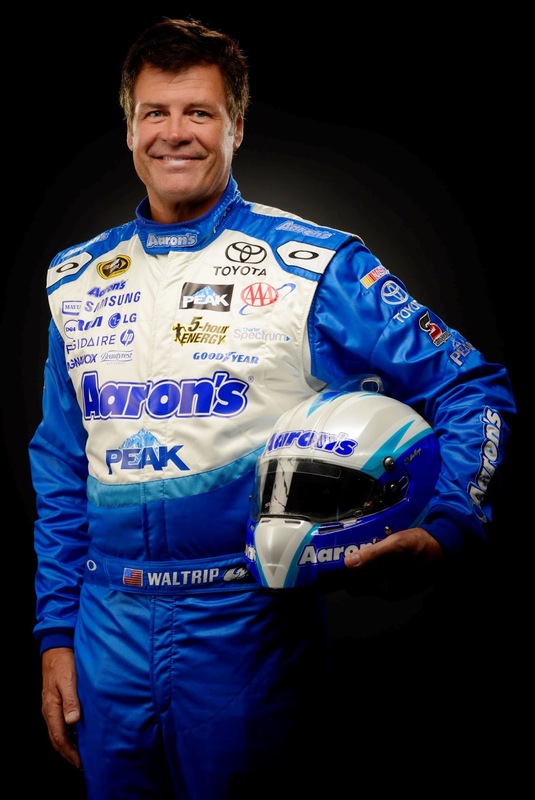 Waltrip, founder and co-owner of Michael Waltrip Racing, replaces 22-year-old Brett Moffitt, who has driven MWR’s No. 55 since the March 22nd race at Auto Club Speedway in Fontana. Moffitt is filling in for Brian Vickers, who is sidelined after a recent bout with recurring blood clots. Waltrip owns 779 Sprint Cup starts and finished 26th driving the No. 55 in the Daytona 500 on Feb. 22 in his lone 2015 start. The May 3 and Oct. 25 Talladega races are the only remaining races Waltrip is scheduled to drive this season. Race fans attending the third annual Dover International Speedway vs. Pocono Raceway celebrity softball game were treated to an entertaining afternoon in Trenton, N.J. yesterday. The game was part of NASCAR’s Victory Tour program to promote the upcoming Dover and Pocono race weekends, and was played at ARM & HAMMER Park, home of the Trenton Thunder, prior to their AA League game that night versus the New Hampshire Fisher Cats. The game included the four NASCAR personalities -- Dale Earnhardt Jr., Joey Logano, Todd Bodine and Darrell Wallace Jr. -- along with members of the media and other dignitaries. Mike Bagley of Motor Racing Network and Sirius XM NASCAR Radio served as emcee for the event. The game also provided content for MRN’s nationally syndicated NASCAR Live program on Tuesday night, hosted by Bagley. Dover won the five-inning game, 12-6, setting the celebrity softball series now at 2-1 in favor of Team Dover. Before the game there was a moment of silence for Steve Byrnes, the well-known NASCAR announcer who passed away on Tuesday after a long battle with cancer. Both teams taped armbands to their jerseys in honor of him. Pocono got off to a hot start to begin the game, with Wallace Jr. recording the first run of the game, and tacked on two more runs in the second inning with back-to-back home runs from Crockett (WXTU-FM personality), and Pocono Raceway president Brandon Igdalsky. With the score 3-0 in favor of Pocono entering the top of the third inning, Ryan Troutman (AAA Mid-Atlantic) began the comeback charge with a solo home run. Chris Shearn (YES Network) drove in another run with a ground-rule double, and Chris Flood (Cape Gazette) gave Dover a 4-3 lead with a ground-rule double of his own. 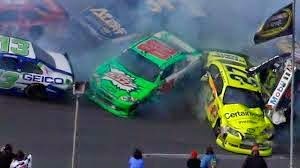 At one point in the game, with Logano playing defense at second base, a comical collision occurred when Wallace Jr. slid into Logano as he valiantly tried to tag him out. 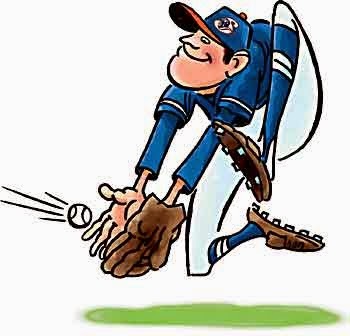 Although Wallace Jr. was ruled safe, Logano got the last laugh by turning a timely double-play to end the fourth inning in style. Team Dover rode the momentum into the fourth and fifth innings, combining for eight more runs thanks to more power hitting from Flood, who connected on a grand-slam to put a nail in the coffin for Team Pocono. The drivers met with fans and signed autographs throughout the event, and later joined members of the press for a media session following the game. NASCAR returns to Dover International Speedway May 29-31, 2015 and includes the May 29 “Lucas Oil 200” NASCAR Camping World Truck Series, the May 30 “Buckle Up 200 Presented by Click It or Ticket” NASCAR XFINITY Series race and the May 31 “FedEx 400 benefiting Autism Speaks” NASCAR Sprint Cup Series race, which will be broadcast on FOX Sports 1 at 1 p.m. ET. For race tickets or more information, call 1-800-441-RACE or visit www.DoverSpeedway.com. 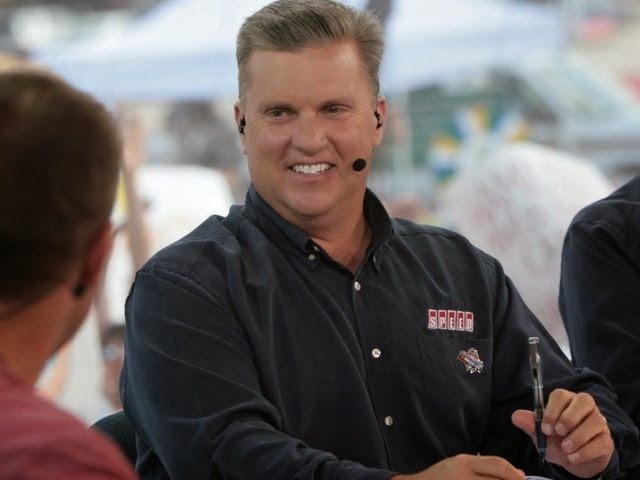 The tributes have flooded in today, in the aftermath of the passing of FOX Sports commentator and NASCAR Race Hub host Steve Byrnes, who lost a lengthy battle with cancer today at the age of 56. Richard Petty -- "Steve was a person who had a real passion for his job and that's what made him stand out as one the best at what he did. He was always humble too, and I never saw him treat anyone unfairly. That's just how he did his job and lived his life. He always treated myself, our family and our race teams with great respect and I admired him for that. He will be missed by many and our family’s thoughts and prayers are with Karen, Bryson and the rest of his family. Eric Shanks, President & COO, Executive Producer, FOX Sports -- "We lost a beloved member of the FOX Sports family today, and we extend our prayers and deepest sympathies to the Byrnes family. It was an honor over the past year to learn just how much Steve was loved and respected throughout the NASCAR community, which was evident this weekend in Bristol. Not even day-long heavy rains could dampen the outpouring of emotion on display. Steve served as a friend and mentor to so, so many, that the shadow he cast will have an impact on our industry for many years to come. The only thing that stands out more to me than Steve as a teacher is Steve as a man, and the bravery and dignity with which he carried himself throughout his terrible illness. We'll miss Steve very, very much." 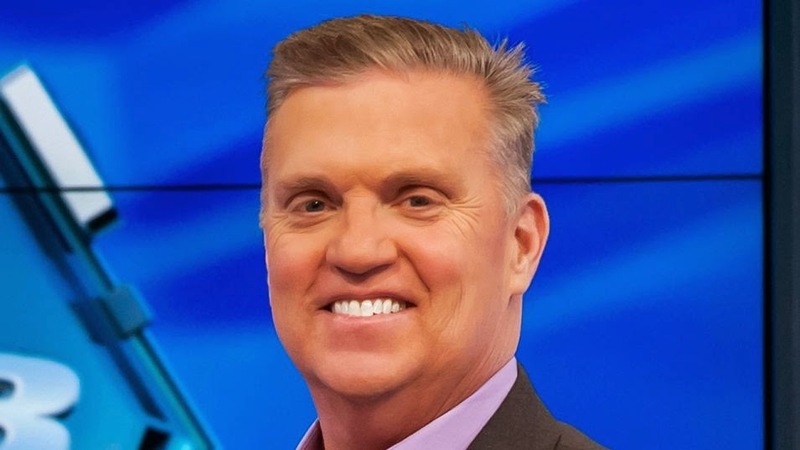 David Hill, Senior Executive Vice President, 21st Century FOX -- "From the very beginning of NASCAR on FOX, Steve Byrnes was one of the linchpins of the broadcast team. His passion for the sport -- his passion for everyone involved with the sport -- shone through week in and week out. But even more than that, Steve was defined by his journalistic integrity and kindness; his ability to communicate everything from complex technical issues to the highly emotive human dramas in this sport, where injury and or death are constantly just one mistake away. The consummate television professional, he established himself as a star on SPEED Channel, where viewers simply loved his knowledge, his sense of humor and his easygoing nature, becoming the Mr. Rogers of NASCAR -- a warm voice everyone trusted. Even more impressive, and fully on display last weekend in Bristol, Steve was loved and respected by the entire NASCAR community, from the drivers to the team owners to the front office executives. I am devastated by his passing -- he was not only a trusted and gifted colleague, but a mate -- my heart goes out to Karen and Bryson." 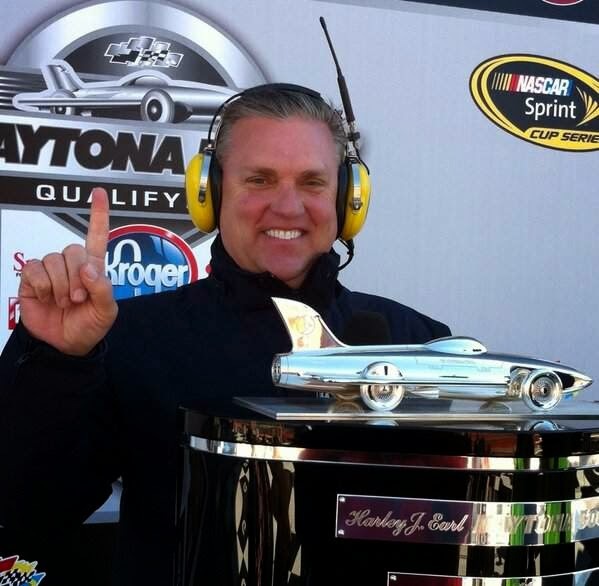 Steve Byrnes lost his long battle with cancer today at the age of 56. The end came more quickly than any of us had hoped, and certainly more quickly than we were prepared for. Steve was able to watch Sunday’s race at Bristol Motor Speedway – an event named in his honor – but took a turn for the worse late yesterday and passed away today with Karen -- his loving wife of 22 years -- and his 12-year old son Bryson at his bedside. 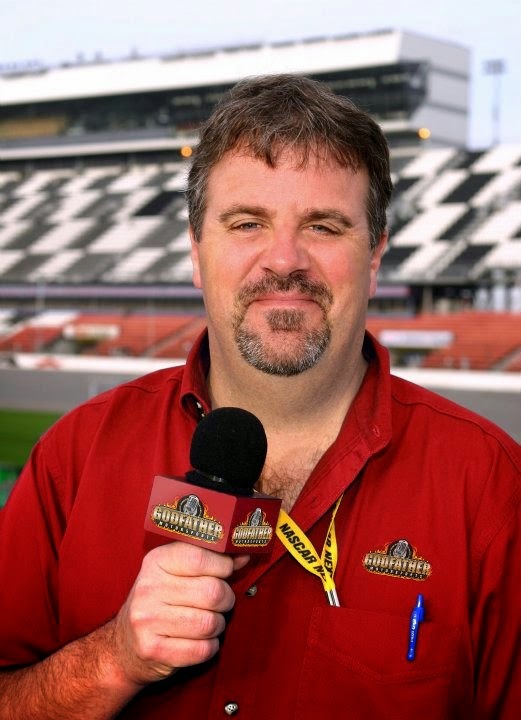 Steve was a frequent guest on our Sirius XM Speedway show for many years, and was gracious enough to co-host the program along with me during Speedweeks 2015 at Daytona. Illness prevented him from traveling to Daytona Beach for the first time in decades, and he was feeling badly about that. We felt bad, as well, and thought we might all feel better by making Steve a part of our program, if only for a day. Four hours can be a long pull -- even for a healthy host – and by the end of the program, Steve admitted that his backside was beginning to drag. I assured him that his mere presence was making the show better, whether he had anything to say or not. In addition to being a top-notch guest, Steve was a good friend. He was the kind of person you put on your short-list; the list of people you knew could count on to brighten every day and never let you down. There are no words to explain what Steve’s family and many friends are experiencing today. None of us were ready for this. We knew that his cancer was both aggressive and deadly. We knew his treatment protocol was not working as well as he and his doctors had hoped. We knew that he had suffered some serious setbacks in the last couple of weeks; blood clots and a bout with pneumonia that made his future anything but certain. 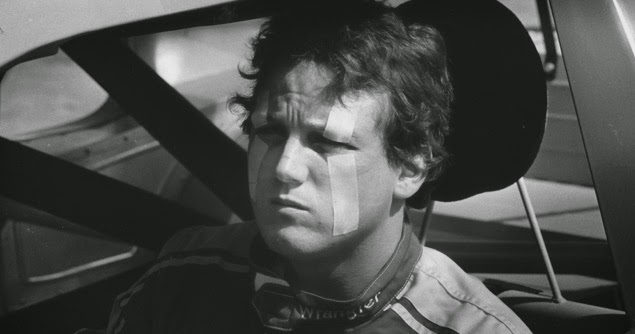 But we also knew that Steve Byrnes was a fighter. We knew of the amazing support system he had in place -- led by Karen and Bryson, who have been absolute rocks throughout this ordeal -- and hoped against hope that our friend would somehow beat the odds and prevail. Unfortunately, it was not to be. 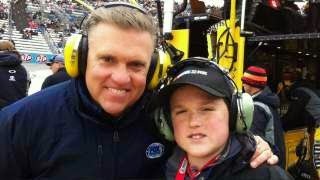 Steve Byrnes was tough, but cancer was tougher. Back on January 14th of this year, Steve joined us on Sirius XM Speedway to update his condition. We hadn’t heard much from him in the weeks following the news that his cancer had returned, but he spoke eloquently about the important lessons learned from his battle with cancer. Most of those lessons involved family and friends, the importance of holding loved ones close and treasuring every day we are granted on the planet. Those lessons seem all the more poignant today, now that he’s gone. Steve’s final public words came Sunday night, when he responded to a fan asking via Twitter if he had watched the rain-delayed Bristol race, in its entirety. His response consisted of only four words, but those four words said all that needed to be said. “I went the distance,” he wrote. Yes you did, brother, and you made us all proud. Safe travels, and Godspeed. Since its founding in 1948, NASCAR has been a tough sport, populated by tough guys. In the early days, drivers ran more than 100 races each season, traveling from track to track with little more than the previous night’s winnings to support them and their families, while still keeping the race car rolling. Safety was little more than an afterthought, with injuries and on-track deaths not uncommon. Through it all, though, drivers were forced to persevere, blocking out the pain in an attempt to keep moving money across the table. With no time to heal, drivers were forced to bind their wounds, patch their cars together and get down the road to the next race, creating a warrior mentality that produced some amazing stories of human perseverance. The most recognized name in NASCAR, Richard Petty, famously ran a number of races with a broken neck in 1980, keeping his injury hidden from NASCAR officials despite knowing that another wreck would almost certainly kill him. “Of all the races we ran,” admitted Petty following his retirement, “there were probably 100 of them that I shouldn’t have been in the race car. At least 100 of them. Petty was far from alone. Ricky Rudd walked away from a gyrating, eggbeater of a crash during the 1994 Busch Clash at Daytona International Speedway that saw his car flip six times through the infield grass. Two days later, with Daytona 500 qualifying on the agenda, Rudd’s eyes were swollen nearly shut. “I could hardly open my eyes,” recalled Rudd. “They were like little slits (and) I knew I had to fix it. While the guys were changing the spark plugs, I went and got a roll of duct tape. I didn't have Band-Aids. I would have used Band-Aids, but I didn't have any. I duct taped it; took all the extra skin, taped it to my eyelid, taped that up to my forehead, put my helmet on and went on." Amazing as it sounds, Rudd’s swollen eyes were not the worst of his predicament. The Daytona incident is not the only example of Rudd’s tough-guy status. In 1998 at Martinsville Speedway, the Virginia native dominated the NAPA Auto Care 500, despite running without power steering while battling an exhaust leak that allowed fumes to enter his car on a 100-degree day. Rudd persevered to claim the checkered flag then passed out cold in Victory Lane. Tony Stewart has also done his share of sheet time in the aftermath of crashes. A pair of wrecks on consecutive days at Charlotte Motor Speedway in 2006 left the former series champion with a broken right shoulder blade. With the circuit set to compete at the high-banked Dover International Speedway the following week, there was little doubt that Stewart would need relief. Ironically, he turned to Rudd, who kept the team’s championship hopes alive with a 25th-place finish. More recently, Stewart missed the final 15 races of the 2013 campaign after suffering a compound fracture of his lower-right leg in an Iowa Sprint Car crash. In 1990, Darrell Waltrip broke his left femur in a grinding, seven-car practice crash prior to the Pepsi 400 at Daytona. He underwent more than 10 hours of surgery to repair and stabilize the break, with surgeons attaching an 18-inch long steel plate to piece together his shattered-in-three-places femur. 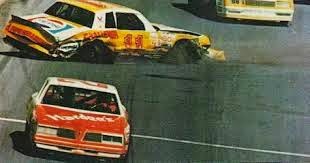 Waltrip also suffered a concussion, fractured left elbow and broken ribs in the crash; raising the total of injuries sufficient to remove him from competition to four. Despite that laundry list of trauma, however, Waltrip started the next week’s event at Pocono Raceway. Waltrip was fitted with a special brace to stabilize his surgically repaired femur, allowing him to be lifted – with great pain -- into and out of his car by crewmembers. He started the next Pocono race, immediately giving way to relief driver Jimmy Horton before finally admitting defeat and skipping a number of events in order to allow himself to heal. Doctors said the former NASCAR Cup Series champion would be sidelined for a year. He was back in the car in 90 days. Terry Labonte sustained a comparatively minor neck injury in the same Daytona crash, but drove the next day, finished fourth. Veteran Dave Marcis suffered a hairline fracture of the left leg, but like Waltrip, started the race before turning his car over to J.D. McDuffie en route to a 20th-place finish. "Stupidest thing I ever did." 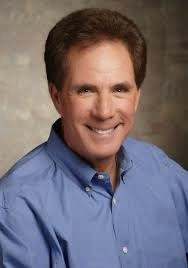 “(Starting the Pocono race) was a setback, both mentally and physically,” said Waltrip. “Getting in and out of the car was tough. I went to the shop so (crew chief) Jeff Hammond and the boys could practice stuffing me down in there and getting me back out. It was just a dumb thing to do. It was the stupidest thing I ever did. “Doctors speculated that my career might be over,” recalled Waltrip. “I lost a sponsorship deal because they said they didn’t want a driver with a broken leg. So I know how these drivers feel. They feel pressure from their teams and sponsors. They feel like they’re letting people down if they’re not there in the car, keeping themselves up in points and in the running to make the Chase. “If I had it to do again, I would say, `No, I don’t think that will work,’” he admitted. “When you’re hurt, you’re hurt, and you’ve got to admit it. The smart money is to stay home, get yourself healed up and then go back to work. Modern-day NASCAR drivers have finally begun to embrace that mentality; some more grudgingly than others. NASCAR has also done its part, instituting new rules requiring drivers to be examined and cleared by a medical liaison after each and every crash. The sanctioning body recently began administering offseason neurocognitive baseline testing to its athletes, as well, establishing healthy parameters to use when examining drivers in the aftermath of a crash. Those new protocols were instituted after the sport’s Most Popular Driver, Dale Earnhardt, Jr. suffered a pair of concussions within a month at Kansas and Talladega in 2012. Earnhardt described his Kansas test crash as "the hardest hit I've ever had," and after a subsequent wreck just four weeks later at Talladega, he knew instantly that something was not right. Earnhardt already knew a thing or two about playing hurt. In 2004, he suffered significant burns to his back, neck and thigh in a sports car crash at Infineon Raceway, but insisted on starting the next few NASCAR races before giving way to relief drivers. Older, wiser and perhaps more secure concerning his place in sport, the third-generation driver did things differently in 2012. Ignoring decades of tough-guy “rub a little dirt on it” mentality, he consulted doctors after the Talladega crash and actually heeded their advice, doing what few of his predecessors had ever done before; removing himself from the race car for two events in the heart of the championship Chase. “It almost cost me my career,” says Earnhardt of his concussion scare. “It almost cost me my happiness." 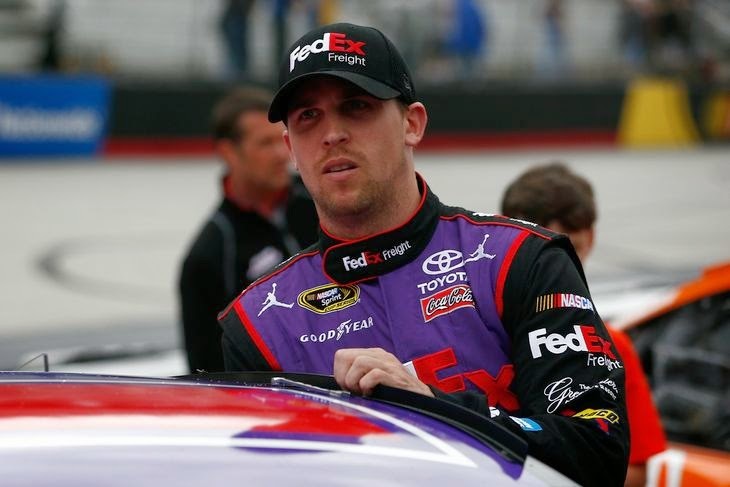 Yesterday at Bristol Motor Speedway, Denny Hamlin chose not to return following a lengthy red-flag stoppage for rain, complaining of muscle spasms and pain in his upper back and neck. He was replaced by youngster Erik Jones, who did yeoman work before being swept up in a late incident and finishing 26th, six laps down. In another era, Hamlin might have faced the same pressure to continue – despite the possible risk – that Petty, Waltrip and Rudd experienced in their day. In another era, the Joe Gibbs Racing driver might have yielded to the “Macho Man” mentality that prompted decades of drivers to risk life and limb in the pursuit of a few championship points. Sunday, however, Hamlin was allowed – and even encouraged – to make a better choice.